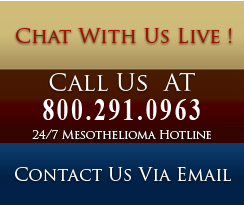 If you or a loved one has been just diagnosed with - or a loved one has died from work related mesothelioma or some other asbestos-related disease, please complete the Mesothelioma Attorney Contact Form for a quick reply within 12-24 hours. The information you submit will be held in total confidence. It will be used exclusively for the purpose of evaluating your case and determining if you may be entitled to a cash settlement. Your privacy is ensured. Diagnosing mesothelioma is often difficult, because the symptoms are similar to those of a number of other conditions. Mesothelioma diagnosis begins with a review of the patient's medical history, including any history of asbestos exposure. A complete physical examination may be performed, including x-rays of the chest or abdomen and lung function tests. CT (or CAT) scan or an MRI may also be useful. CT Scan used for a mesothelioma diagnosis is a series of detailed pictures of areas inside the body created by a computer linked to an x-ray machine. MRI used for mesothelioma diagnosis is a powerful magnet linked to a computer that is used to make detailed pictures of areas inside the body. These pictures are viewed on a monitor and can also be printed. Your doctor will review your work history, especially whether you have worked in an industry in which you may have been exposed to asbestos. If fluid is present in the pleura or peritoneum, a thin needle may be used to collect a small sample of the fluid for examination. This procedure, called fine-needle aspiration, also may be used to drain the fluid to relieve symptoms such as chest pain and shortness of breath that can result from an effusion. Occasionally, mesothelioma can be diagnosed with this fluid sample alone, but usually a tissue sample (biopsy) is required. The tissue sample can be obtained via thoracoscopy (for a pleural tumor) or via laparoscopy (for an abdominal tumor). In both procedures, a tubelike instrument inserted through a small incision allows the physician to view the tumor and collect a tissue sample. Patients suspected of having pleural mesothelioma also may need a procedure called bronchoscopy. Pericardial Mesothelioma is a cancer of the lining surrounding the heart (pericardium). Biphasic or mixed (a combination of both of the other cell types). Stage I - The tumor is found in the pleura with or without some involvement of the lung, pericardium (lining of the heart) or diaphragm. Stage II - The tumor is found in a stage I location, plus there is involvement of some lymph nodes in the chest. Stage III - The tumor has extended into the chest wall, ribs or heart, through the diaphragm or into the peritoneum (the abdominal lining). There also may be involvement of the lymph nodes. Stage IV - The tumor has spread through the bloodstream to distant sites (that is, it has metastasized). Recurrent mesothelioma - The tumor has recurred after treatment. Once it develops, this type of cancer will continue to grow and spread until treatment is provided. To reduce your risk of malignant mesothelioma, you should reduce your exposure to asbestos. Because there is no safe level of asbestos exposure, any asbestos exposure is too much. Especially if you have an older home, check for areas of exposed asbestos-containing insulation or other areas of deteriorating asbestos. These areas must be removed professionally or safely sealed off. Workers who routinely deal with asbestos-containing materials should use approved measures to limit their exposure and to keep from bringing asbestos dust home on their clothing.